This year’s Take Back the Night march and rally is set for Monday, Oct. 29, at 7 p.m.
October is National Domestic Violence Awareness Month, and Emory recognizes it as Relationship Violence Awareness Month (RVAM) with a range of campus activities, trainings, a keynote workshop and Take Back the Night rally dedicated to ending interpersonal violence. This year’s schedule of events aspires to bring support and solidarity to those impacted by relationship, sexual and all forms of interpersonal violence, says Wanda Swan, director of Emory’s Office of Respect, a campus hub for interpersonal violence prevention and survivor resiliency. Activities are designed to continue an open dialogue about “what we can do as a campus to help ensure the respect and safety of all of our members and our surrounding community,” Swan notes. 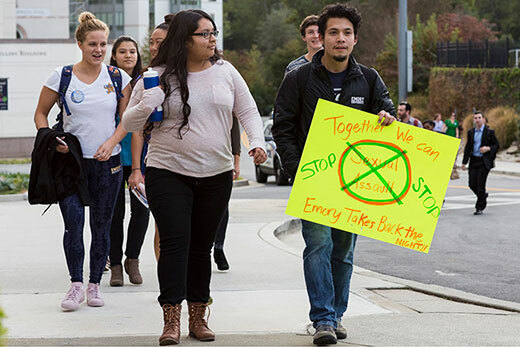 Once again, Emory’s RVAM Committee will bring the annual Take Back the Night rally and march to the campus Monday, Oct. 29, at 7 p.m. Participants are invited to gather at Wagner Quad, the grassy area near Raoul Hall. The featured speaker will be Aparna Bhattacharyya, executive director of Raksha, Inc., a local non-profit that provides services for South Asian survivors and immigrants impacted by violence. The entire campus community is invited to stand in solidarity with interpersonal violence survivors and join in the night’s events. Trauma-sensitive yoga, used to treat complex trauma, chronic pain and PTSD, will be offered in Woodruff PE Center 306 from 5 to 6 p.m. Participants should bring an Emory ID card. Equity and diversity educator Chris Linder, assistant professor of higher education at the University of Utah, where her scholarship focuses on sexual violence and student activism, will facilitate an interactive campus workshop addressing what’s next for interpersonal violence prevention and response at Emory. The workshop will be from 4 to 5 p.m. at the Miller Ward Alumni House and is open to all Emory faculty, staff and students. Light refreshments will follow. Those interested in attending should register at https://bit.ly/2Qd84Mx. Join the Office of Respect in a day of demonstrating solidarity for survivors of violence by donning purple. A prize will be awarded for the most creative display of purple by an individual or group on campus; participants are invited to tag Emory’s Office of Respect in social media posts. This event, offered to graduate students only, will help participants learn how to identify, report and respond to sexual harassment. Training will be held from 10 to 11:30 a.m. in the Claudia Nance Rollins Building, Room 2001. Learn more about healthy relationships from noon to 2 p.m. at the Cox Bridge and enjoy free tacos provided by the Office of Respect. For an opportunity to speak out against interpersonal violence and show support for survivors, participants will gather on the Wagner Quad at 7 p.m. Those interested in sharing anonymous stories and accounts to be read at the rally are invited to submit them at https://tiny.cc/etbtn2018. In the event of rain, this event will be moved to the Math and Science Building.